There aren't many things more important to 30-year-old Kelly Sowatsky than her favorite hockey team, the Pittsburgh Penguins. But three things give the Penguins some competition: Kelly's fiance, her music and her desperate search for a kidney to save her life. Three years ago, on Christmas, an infection turned to a blood infection, and the blood infection became kidney failure. Kelly's health has been deteriorating ever since. None of her family members were matches, and even with dialysis, her own kidneys weren't going to last much longer. Desperate, she made a highlighter-yellow sign written in black block-letters (to match her Penguins jersey) to a Pittsburgh hockey game in March. Within minutes, she was overwhelmed with texts, calls and messages. 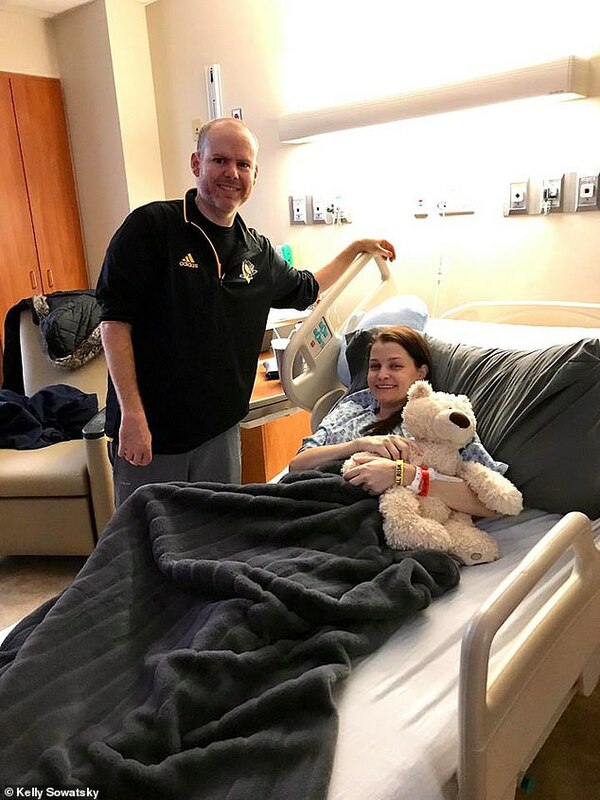 Within two days, she had found her donor, hundreds of miles away: Thirty-five-year-old Jeff Lynd. At 30, Kelly has lived an impressively full life, working as a musician for several years in Nashville before moving back to Pennsylvania to teach special needs children. But when her kidneys began to fail, she was nowhere near ready to give up her momentum to accommodate endless trips to the hospital for dialysis. Her kidney failure came seemingly out of nowhere. On Christmas in 2015, Kelly started to feel generally ill, and it wasn't long before she was in the hospital with sepsis. 'It's unclear what led to it, but we think it may have been a urinary tract infection that we didn't know I had, which turned into sepsis, in a matter of hours, really,' Kelly told Daily Mail Online. First the sepsis struck her lungs, and Kelly spent 12 days in the hospital, hooked up to a ventilator to breath for her. About as soon as she seemed to be recovering, Kelly developed excruciating back pain. The sepsis had moved to her kidneys and they were failing - fast. Within a year, they were functioning at just 50 percent. Then, over just a couple of months, her kidney function plummeted to 20 percent. Last week, her kidney function was at just seven percent. Up until now, she had managed to avoid dialysis clean the sediments out of her blood that her kidneys were no longer able to flush. 'My doctors said that the fact that I'm a small and don't have a whole lot of muscle mass is probably why I was able to stave off dialysis as long as I did,' she said. That time was over. Kelly would need dialysis to keep her alive, her doctors insisted. 'Dialysis has it's own set of challenges, though, aside from just suffering from chronic kidney disease,' she said. She would have to make several trips a week to the hospital to have dialysis, wouldn't be able to bring her beloved pets with her, and would disrupt her work life. 'Dialysis didn't work for my lifestyle,' Kelly said. The only other option for Kelly was a transplant. But the only match in her family was her mother - who is also Kelly's caretaker. 'My doctors highly recommended that she not be the donor,' she said. So that left the transplant list, where Kelly's name might sit for four to six years before it was her turn and she found a match. Kelly had one more idea. An avid hockey fan, she realized that at a game, she could cast a wide net for donors who might feel like kindred spirits. So, she hand-lettered her highlighter-yellow sign asking for a kidney. 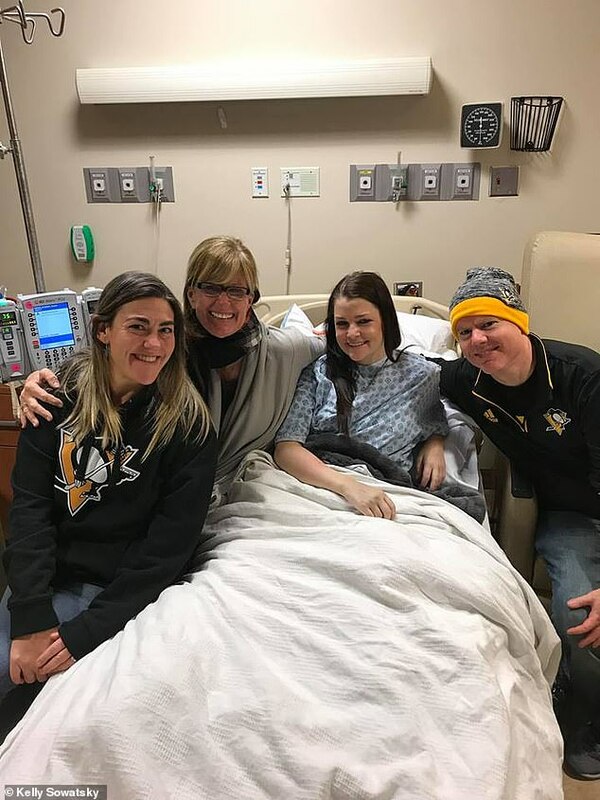 She and her fiance, Tyler Hart, went to the March 31 Penguins game, armed with their last hope for Kelly's health. 'I had a feeling that in the right venue, at the right time and place, this would work,' Kelly said. Despite her past life as a performer, Kelly felt sheepish about the sign at first. She held it at her knees for the early part of the game. 'But I had to make myself vulnerable,' she said. The picture of Kelly that the Penguin's social media manager tweeted reached thousands of eyes. But really only the right person needed to see it. That person was Jeff Lynd, a Pittsburgh native living six-and-a-half hours away in Delaware. 'The Twitter sign caught his eye, and he just really wanted to do something about it,' Kelly explained. On Tuesday, November 6, Kelly received Jeff's kidney. 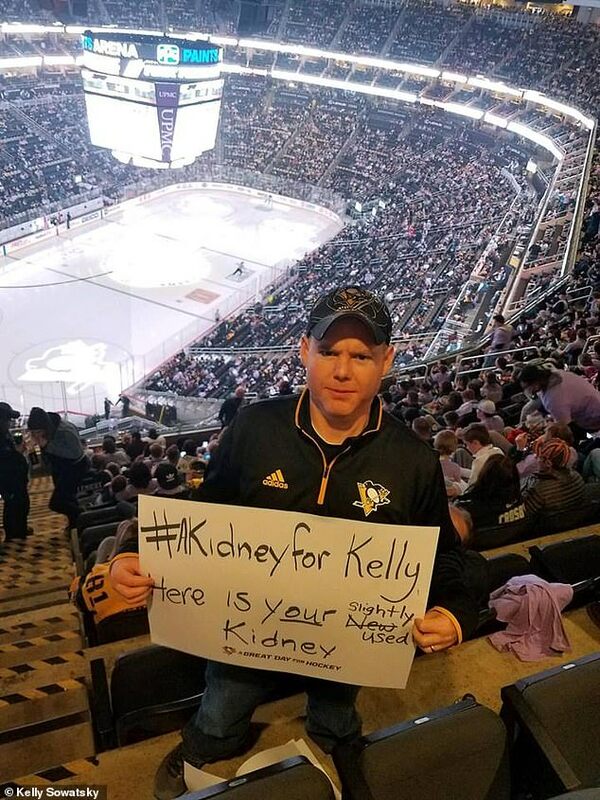 Along with a new kidney, Kelly has gained a new friends in Jeff. In fact, Jeff and his wife spent Wednesday night at a Penguin's game with Kelly's fiance, Tyler. Kelly wanted to go to the game, but her doctors said two weeks out from a transplant is a little too soon for her to be out and about while on immunosuppressants.